I mentioned in this post that I had made two cards for our niece’s wedding. Today I’m back to show you the second that I made for us to give to her. As I had made the other card using blue I decided to make this card with red. I used 2 dies of the same set of the nestabilities lacey circles dies to create the 3 circles for the main part of the card and used 2 embossing folders on the background of the card and one for the small circles too. 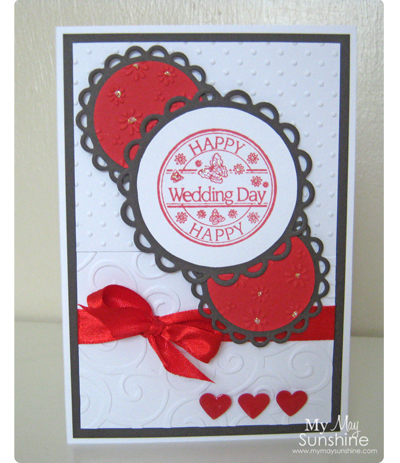 To add more dimension to the hearts, I added some glossy accents to make the hearts glossy and added some stickles glitter to the flower embossing to make them sparkle. dies | Ribbon – Local craft shop | Stickles crystal | Rangers Glossy Accents.